Baby Lincoln’s older sister, Eugenia, is very fond of telling Baby what to do, and Baby usually responds by saying “Yes, Sister.” But one day Baby has had enough. She decides to depart on a Necessary Journey, even though she has never gone anywhere without Eugenia telling her what to take and where to go. And in fact Baby doesn’t knowwhere she is headed — only that she was entirely happy in the previous night’s dream, sitting aboard a train with a view of shooting stars. Who might Baby meet as she strikes out on her own, and what could she discover about herself? Will her impulsive adventure take her away from Eugenia for good? Chris Van Dusen is the author-illustrator of The Circus Ship, King Hugo's Huge Ego, and Randy Riley’s Really Big Hit, and the illustrator of the Mercy Watson and Tales from Deckawoo Drive series as well as Mac Barnett’s President Taft Is Stuck in the Bath. Chris Van Dusen lives in Maine. This story is certain to resonate with anyone who has ever felt overpowered by authority. 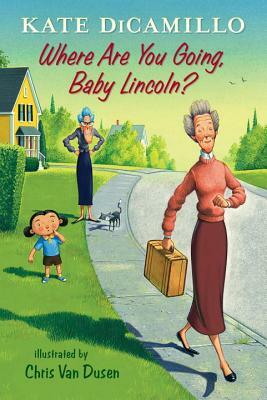 To her credit, DiCamillo explores the Lincolns’ complicated relationship without completely dumping on Eugenia. Yes, Eugenia is overbearing, but the sisters do love each other. Stella’s parallel struggles (as Frank’s younger sister) help to move the plot forward and demonstrate other acceptable ways of gaining agency. As always, Van Dusen’s signature artwork is pleasing to the eye and will help emerging readers make sense of the story’s nuances and quirkiness. This Deckawoo Drive adventure is sure to inspire anyone taking his or her own tentative steps toward independence. One of the wonderful things about two-time Newbery winner Kate DiCamillo (Flora & Ulysses; The Tale of Despereaux) is that she sometimes makes grown-ups the heroes of her children's books...Chris Van Dusen's (Mercy Watson series) expressive illustrations add humor to this heartwarming story of both necessary journeys and the joys of coming back home. DiCamillo's gentle picaresque is told with tender humor in brief descriptive sentences that totally avoid high drama and histrionics. The third-person narration is unintrusive, allowing readers to respond to this grown-up's journey of self-discovery along with her and perhaps to explore their own sibling relationships as well. A loving and sweet addition to the Deckawoo Drive series. Those who have bossy older (or younger) siblings will immediately connect with Baby as she sets off to experience life without the direction of her older sister...Lending itself well to classroom read-alouds and discussions, and independent and bedtime reading, this title is most certainly a recommended purchase for those serving a young elementary age range. A generous helping of full-page and spot illustrations adds to the energy and to our understanding of the characters. These stories—with their portrait of timeless small-town America; their use of adult characters as kid stand-ins; their celebration of mild ironies; and their pleasure in language (“You must be firm and resolute, particularly with mice. You must brook them no quar- ter”)—are a welcome addition to a time-honored tradition of children’s writing. Fans of Kate DiCamillo will be excited to see the third title in the Tales from Deckawoo Drive series...Children will identify with Baby’s struggle against authority and will enjoy the story whether they have read the first two books in the series or not.